Anita McBride said that the American public has expected the First Lady of the United States to play certain roles, and those roles changed over time. “We expect them to use voice and comment on social issues,” McBride stated. 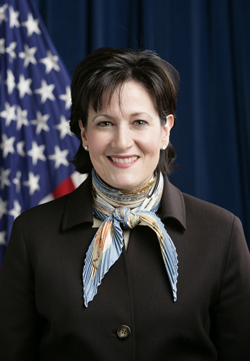 When it comes to the role of the First Lady, nobody seems to understand better than Anita McBride, who has not only worked with former President George W. Bush, but also with his wife Laura Bush. McBride, who served as Assistant to President George W. Bush and as Chief of Staff to First Lady Laura Bush from 2005-2009, joined students participating from the George Mason University Video Studio along with Steve Scully, the political editor for the C-SPAN networks, and students from the Georgetown University and Purdue University. The distance learning course, which is produced by C-Span, is a unique opportunity for students to interview guests via video conference. The course airs on C-SPAN3 on Fridays at 5 pm and also streams online (http://www.c-span.org/Distance_Learning/). She explained how Laura Bush was typecasted by the media as the “shy, retiring librarian,” but managed to break through that with a voice of her own. McBride illustrated that we, the public, expect our First Lady to be deeply engaged. 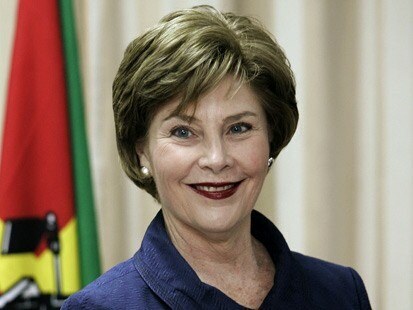 For example, Laura Bush did this by focusing on global health awareness and the Emergency AIDS plan. Now, First Lady Michelle Obama has focused on the issues of school bullying, obesity and military families. This raised the question of whether a First Lady do too many issues and lose focus, but the answer according to McBride is “Michelle Obama has been very strategic, and so far she’s only focused on how to become more engaged with your children’s life.” I think these issues presented by Michelle Obama are perfect for today’s nation, and for her, as she has two emerging teen daughters of her own. As for the Obama Administration, she said “No other leader faces what the United States President has to face,” so she is very happy to hear that the Obama’s seem like a normal family with a dad, mom, kids, homework and even a dog. What if there was to be a First Man if a woman president was elected? McBride says it would simply stay the same job, to support the wife and for the man to have a voice of his own. Excluding the thee First Lady’s she has worked for, which First Lady in history would she have liked to work for? McBride: Abigail Adams and Dolly Madison. Mrs. McBride is also a member of the U.S.-Afghan Women’s Council, a historic public-private partnership between the U.S. and Afghan governments, Georgetown University and private sector institutions to help Afghanistan women find their place in a post-Taliban society. “They [the Afghan women] don’t want a hand out, they want a hand up, they don’t want to be perceived as victims,” McBride explained. Brad Kalbfeld knows what it’s like to be a journalist. He has been doing it for more than 36 years. Three weeks ago, on Tuesday, April 5, Kalbfeld joined students in Steve Klein’s COMM 361 Online Journalism class and spoke regarding the implications of the iPhone. He brought with himself, a typewriter, a Telex machine, a bulky laptop and an iPhone. 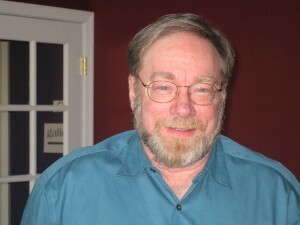 “From typewriters to laptops, journalism has taken a drastic turn of events…for the best,” said Kalbfeld, a former international correspondent for the Associated Press. Kalbfeld also helped in writing the 2006 AP Style Guidebook. “I used this Telex machine where I would have to pay by the word,” Kalbfeld said. Sound similar to something we used nowadays to save words? TWITTER. As the discussion continued, Kalbfeld displayed a chart that showed the difference between the analog world and digital world. For Kalbfeld, they are all filters to the public. This gives readers the power to decide what news is and what is not. However, there is one problem in citizen journalism for Kalbfeld. According to Anita McBride, no one will ever comprehend what the presidential family of the United States goes through on a daily basis. McBride, assistant to President George W. Bush, has directed a wide range of issues under First Lady Laura Bush’s time at the White House. These issues include education, global literacy, youth development, women’s rights and health, historic preservation and conservation and more. According to McBride, who has worked in corporate philanthropy, Afghan women do not want to be seen as victims. “These women are lawyers, judges, carpenters and teachers,” McBride said. 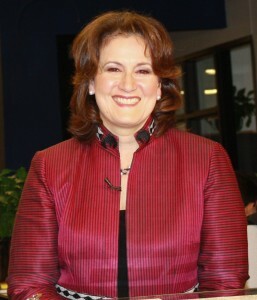 McBride, who is also a member of the U.S. Afghan Women Council, joined students participating from the George Mason University Video Studio along with Steve Scully, the political editor for the C-SPAN networks, and students from the University of Denver. McBride has worked on wide range of philanthropy issues and discussed her take on various issues around the world. Other students who attended the discussion had their own questions to ask McBride. “If you could pick any First Lady in the White House to work for, who would it be?” asked Lexi Ramage, a junior majoring in communication.